Let Rats Decide . . .
For those who think, “Whoa, I would wait a long time for a rat to decide about some of these!” – take heart! JoinRats has lots of ideas to help your rat want to try for you, to be with you, and to more easily try what you suggest. 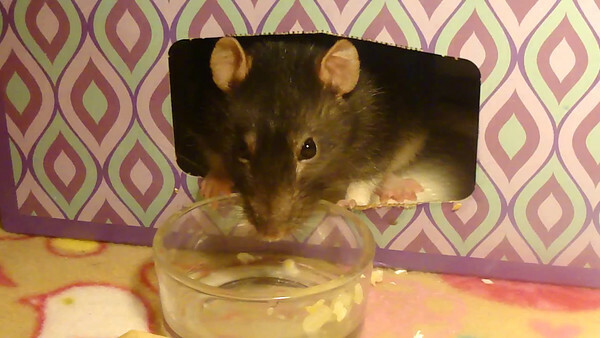 Explore the awesome power of Using Positive Reinforcement to Help Rats Trust. When to move from their human to the table or cage. When to come onto their human's hands. When to move from the human's shoulder, to lay in her arms. When to climb onto their human. When to be touched by their human. To eat yucky medicine food. To come out of the cage when it's time to play or when the human wants her to. All creatures need “Think Time”, to process their emotions, to make decisions, and to feel safe to proceed. Let's keep stress to a minimum. Good for body and mind. Learning happens best when the animal is under threshold. When a rat knows you will respect her “No”, she'll trust you more and be willing to do as you ask more easily. She will know that asking her to do a scary thing will not result in fear or pain, because you'll stop when you see her say “No”. 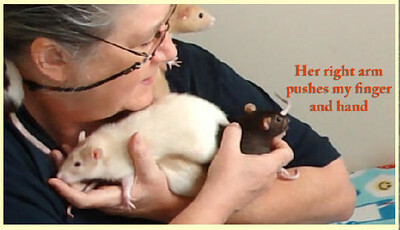 Respecting your rat's resistance, reluctance, or hesitancy, is the opposite of using force. Nobody likes being forced to do anything, and rats are no exception. Click here to view the video in lightbox mode. 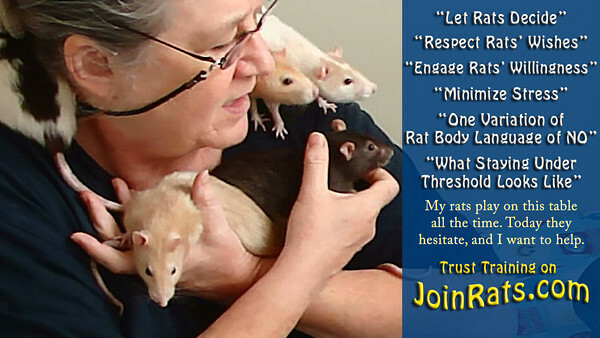 Respect rats' wishes, minimize stress, working with fear in rats, ask, don't make, stay under threshold. When we ask a rat to do something, the more we accomplish these, the better the trust between rat and human.